People lived on the Hill of the rising sun for thousands of years, even before when the Maltese islands were part of a huge continent. From the very beginning, as Baron Kelinu Vella Haber put it in his beloved poem Nadurjana. It is believed that big people lived in the vicinity of St. Blas at " Ta' Imsaqqfin". well before St. Paul shipwrecked in Malta and the locals became Christians. When people were less afraid to sleep outside the walls of the only fortress on the islands of Gozo, in Rabat, the people started to settle on the hill of Ta' Nadur at Ta' Hida. 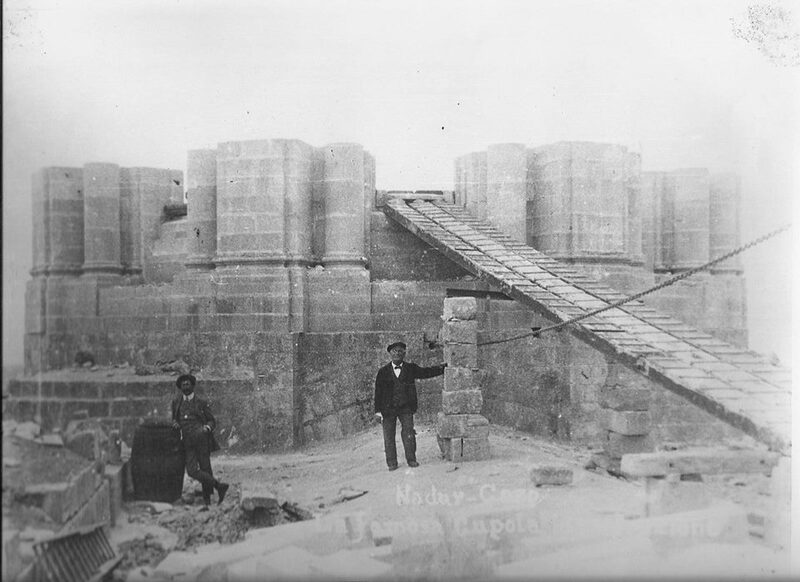 As the population grew and the Matrix church was three miles away, the people living on the east of Gozo, requested the church authorities to erect a parish near their homes. When bishop Palmieri made a pastoral visit to the island of Gozo, in 1687, he heard their request. 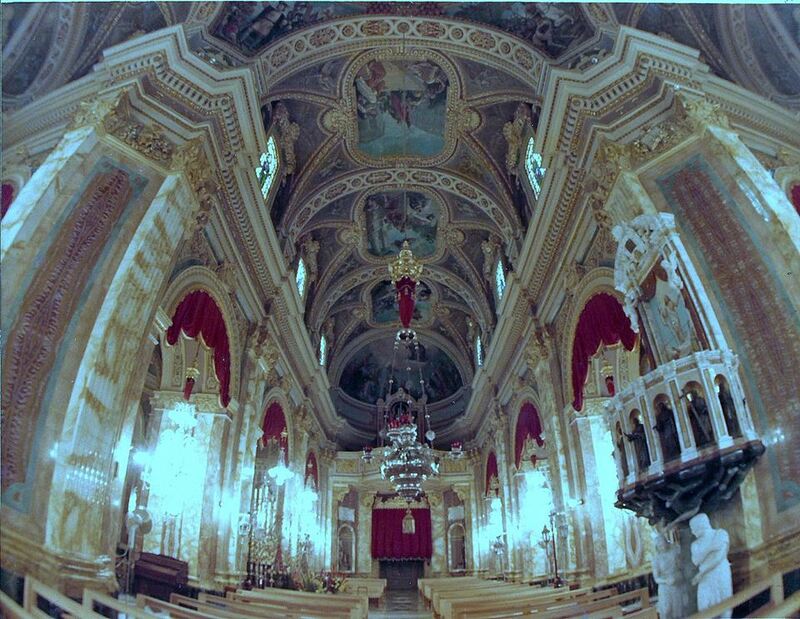 On April 28, 1688, the east of the island, was erected parish dedicated to the Apostles Saints Peter and Paul. 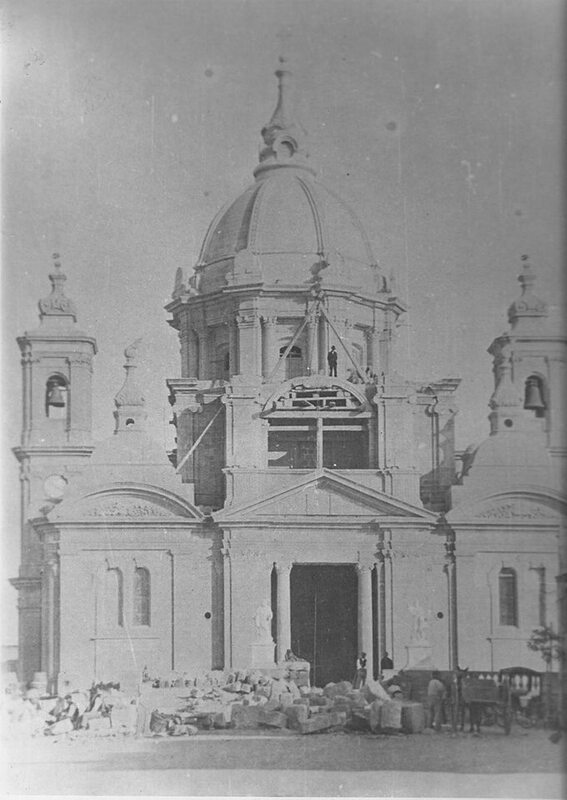 The chapel of the Immaculate Conception of Qala was to serve as a provisionary parish church, till a new church was built on the hill of Ta' Nadur. The new parish in the east of Gozo, consisted of the villages of Nadur, Qala, Ghajnsielem and the island of Comino. 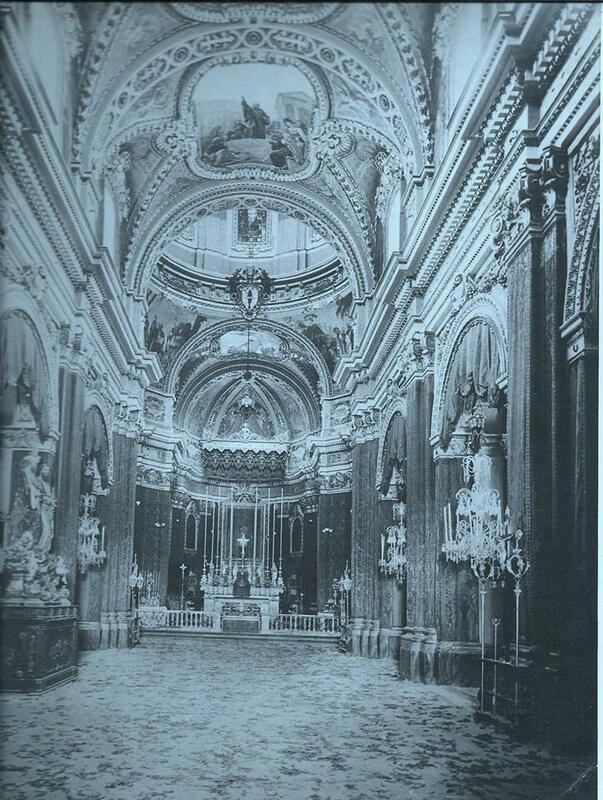 It was the largest parish in Gozo, almost one third of the island. 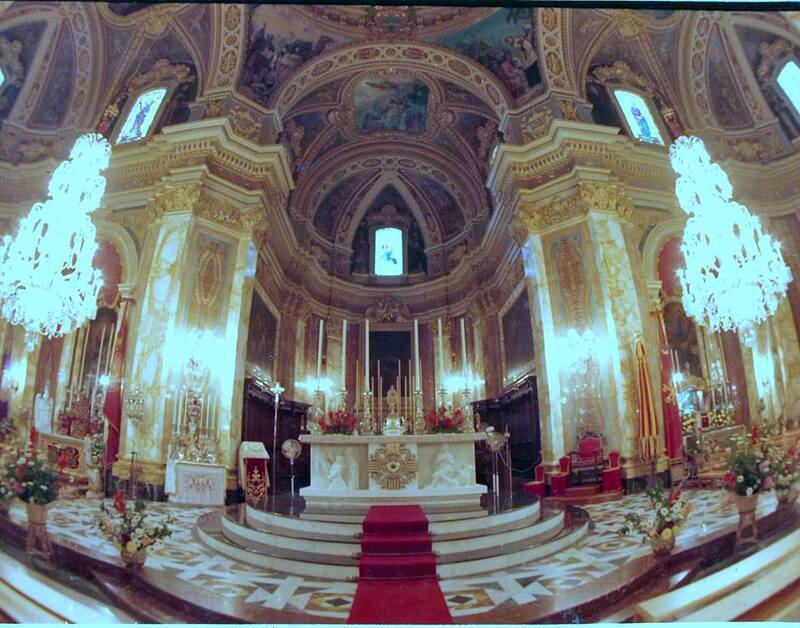 Bishop David Palmieri in declaration, ordered that a new parish church to be built on the hill of Ta' Nadur Grand Master Carafa of the Order of St. John Hospitalers gave some of his land for the church to be built. The new church was built in fifteen years. The village of Ta' Nadur soon became known as Nadur, which means an area of land high above the rest NAY duhr, where one can watch for a possible attack by the enemy. In those times Nadur served as a watch tower where people were placed as guards. The tower of Ta' Sopu, near San Blas was built by the Universita of Gozo in 1667 to keep vigilant on the east of the island. 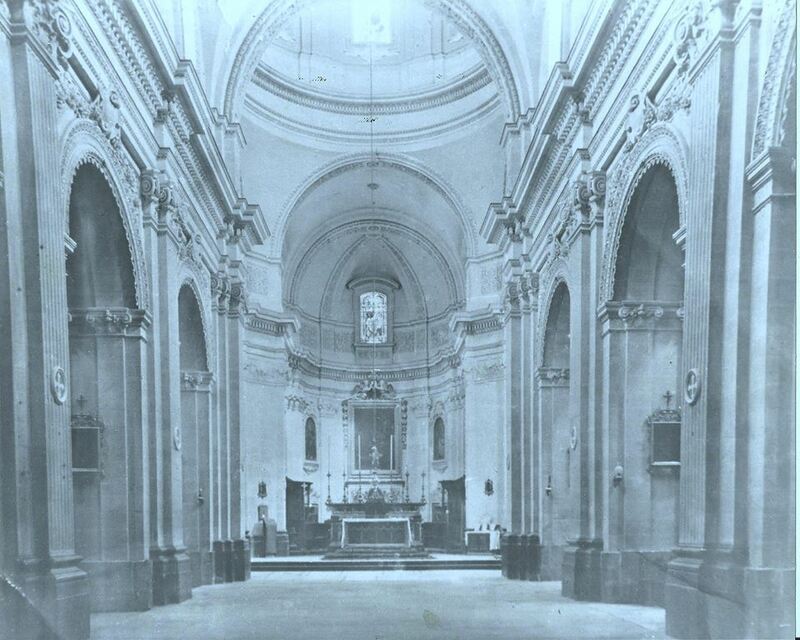 The population of Nadur grew rapidly in less than one hundred years and the parish needed a bigger church. Fr. Salv Galea the forth parish priest of Nadur started the present church on the 7 th. of December, 1760. The construction of the present church was finished and blessed on the 24 th. June 1804. 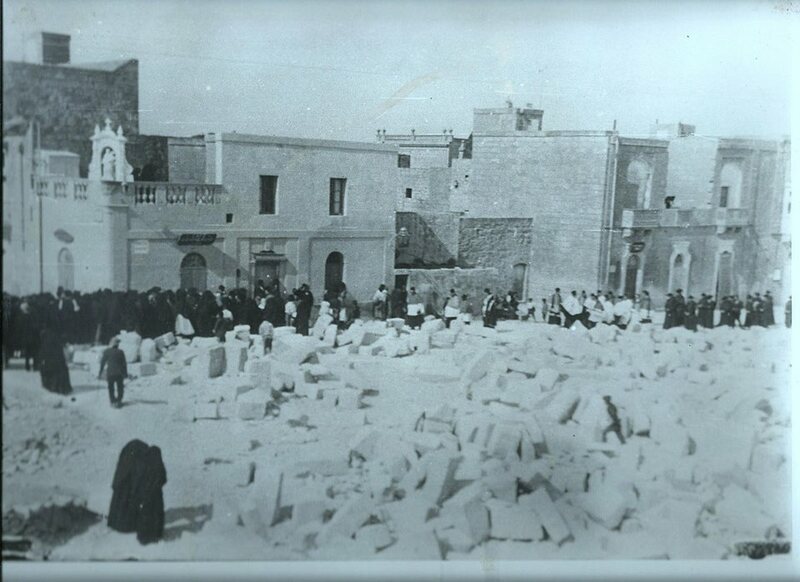 Soon the church became too small again as the population of Nadur continued to grow. 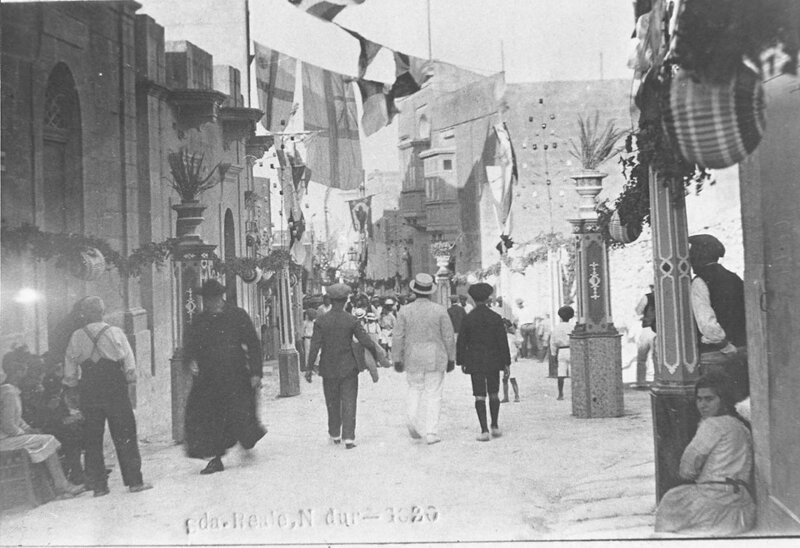 The part of Qala at the left of the start of Qala Road was still part of the parish of Nadur in early 1909. 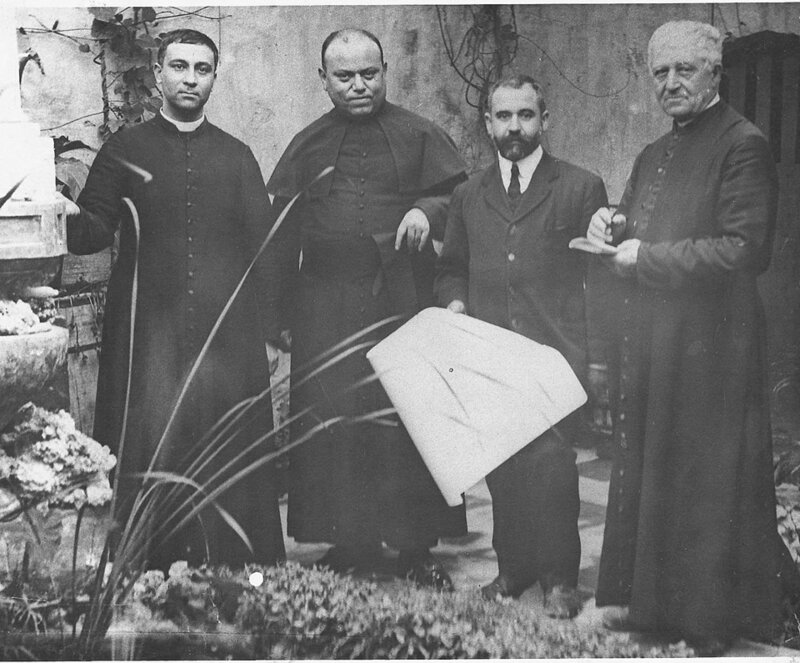 In 1907 Archpriest Martin Camilleri started enlarging the church. He added two aisles, a new facade and a majestic dome. The architect chosen was Francesco Saverio Scortino of Haz-Zebbug, Malta. 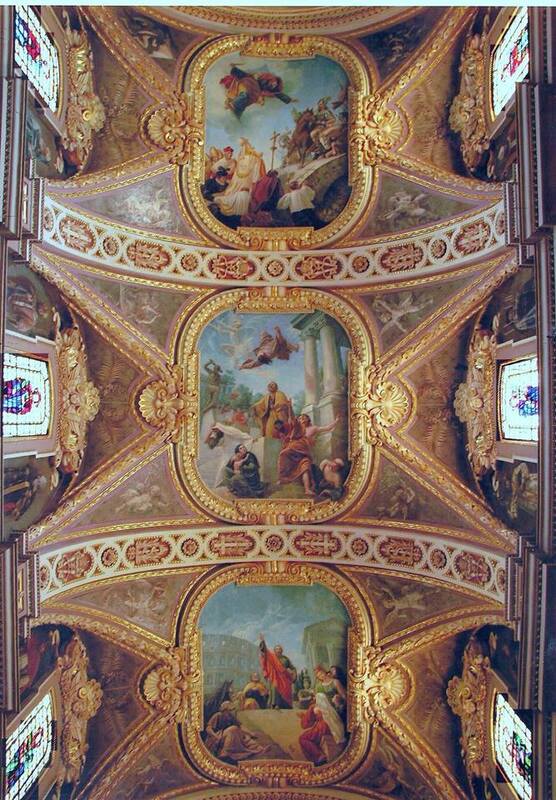 The artist was Lazzaro Pisani, the sculptor chosen was Paul Falzon and the decorator the Italian Pio Cellini. The parish of Nadur was elevated to Archpriest on the 1st. of January 1894. The first Archpriest took the possession of his new title from the Vicar General Dun Ang. Refalo D.D. The parish wasn't contended enough with just one title, so they requested that the parish will be elevated to collegiate. The request was made to the bishop of Gozo, Mgr. G. M. Camilleri. The parish was elevated to Collegiate on the 19 May, 1895. The parish became Matrix to the new parishes of Our Lady of Loreto in Ghajnsielem and St. Joseph of Qala. The parishioners of Nadur always wanted the best for their church and in the fifties many problems arose with the church authorities. The Nadurin wanted their parish to be elevated to basilica. 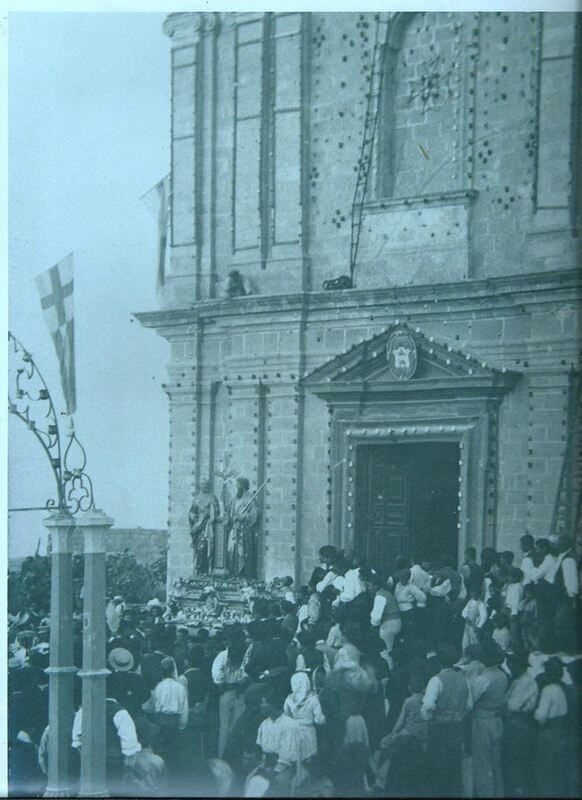 In 1958 all the celebrations in Nadur ceased as a protest by the clergy and the parishioners. 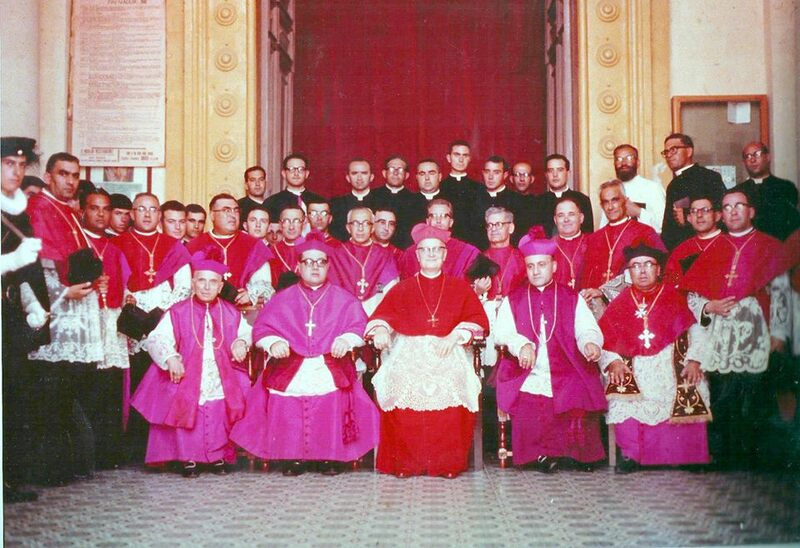 Finally in April of 1967 the news arrived that Gozo have a new bishop Mgr. Nikol Cauchi. In his pastoral visit to Nadur he told the parishioners that he will do anything within his power to help solve the issue. On Sunday 25 th. 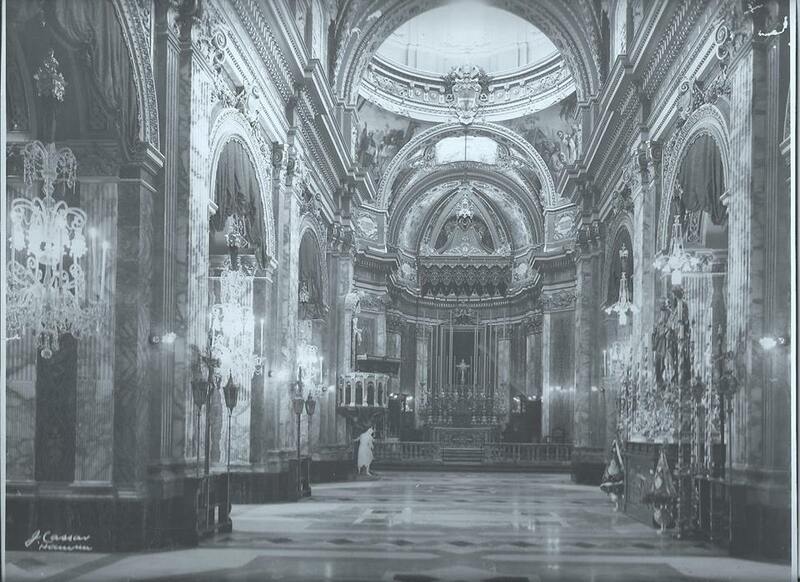 June 1967 the bishop received a message from the Vatican that the parish of Nadur was elevated to Basilica Minor. The bishop rang Dun Martin Portelli brother of the archpriest to tell him about the message. The bells of the church started ringing and the Nadurin took to the streets and the town square to start the celebrations. The joy was indescribable. The feast of St. Peter and Paul was celebrated for the first time in nine years, on the 29 th. june, 1967. In June 1968 the parish celebrated the nineteenth anniversary from the martyrdom of St. Peter and Paul with fifteen days of festivities. The Mnarja Band was inaugurated for the celebrations and Nadur Youngsters F.C. won their first Championship Trophy. Baron Kelinu Vella Haber composed a poem for his beloved birth place Nadurjana, it was recited at a Music and Literature Program at St. Peter and Paul Square as part of the celebrations. Cr. Peter Paul Portelli is being presented a Honorary certificate by Mr. Joe Said, Secretary of the Mnarja Band. 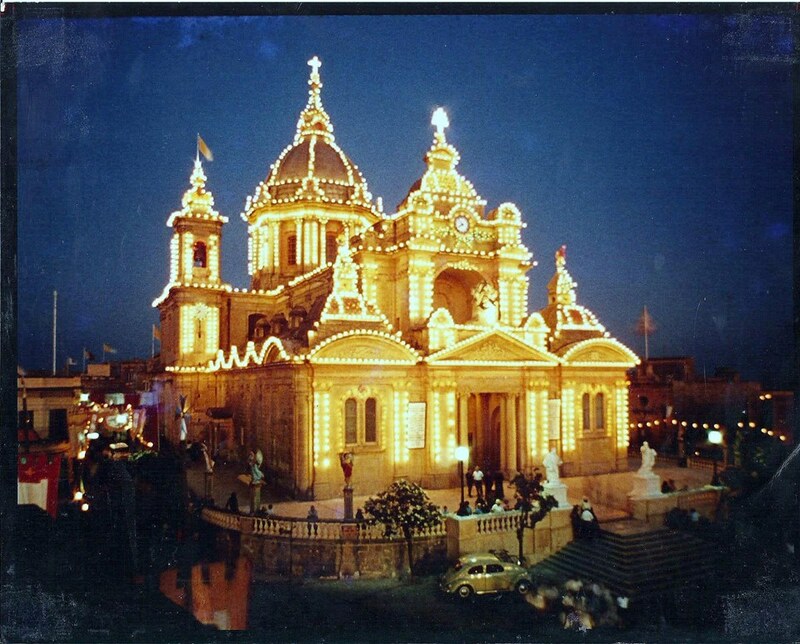 In 1988 the parish of Nadur started the celebrations for the 300 th. birthday of the parish early. Surely the 28 th. of April, was a very special day, the birthday of the parish, especially when its the 300 anniversary. The celebrations continued in June with fifteen days of festivities. The Nadurin in Australia led by Cr. Peter Paul Portelli presented a velvet flag with a gold embroidered emblem to the Mnarja Band. The Sunshine City Council was represented by Councilor Portelli for the festivities. The flag of the Council was presented to Archpriest Salv Muscat in the presence of the Australian High Commissioner. A banner was hung on the balcony of Nadur Youngsters F.C. in December 13 Street that read "Congratulations on your 300 years from your Sister City of Sunshine"
In June 2004 the parish of Nadur celebrated its 200 years from the blessing of the present church. As always the parish celebrated the occasion with fifteen days of festivities. In Australia, the Archbishop of Melbourne His Grace Denis Hart was invited to commemorate the occasion with a High Mass on the feast of St. Peter and Paul, held at St. Bernadette in North Sunshine. 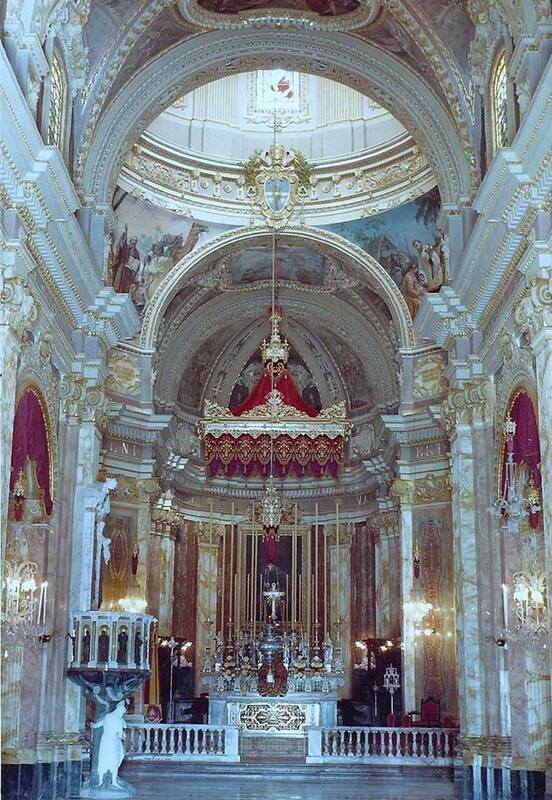 The church was decorated with red damask, a side altar with twelve candle holders and a crucifix, Canopy (tuzell), long candles behind the altar and chandeliers. The hamlet of Ta' Hida is where the first people settled on the hill of Ta' Nadur.. The word Hida according to (Annibale Preca, Malta Cananea) and Can. Gian Piet Agius De Soldanis means "falcon" but Can. Agius De Soldanis calls it "ghox il-hida" which means the nest of the falcon. The first settlers at Ta' Hida, built a small chapel dedicated to St. John the Baptist. Not much is known about this chapel but by 1667 it was in a bad position and it was not in use. 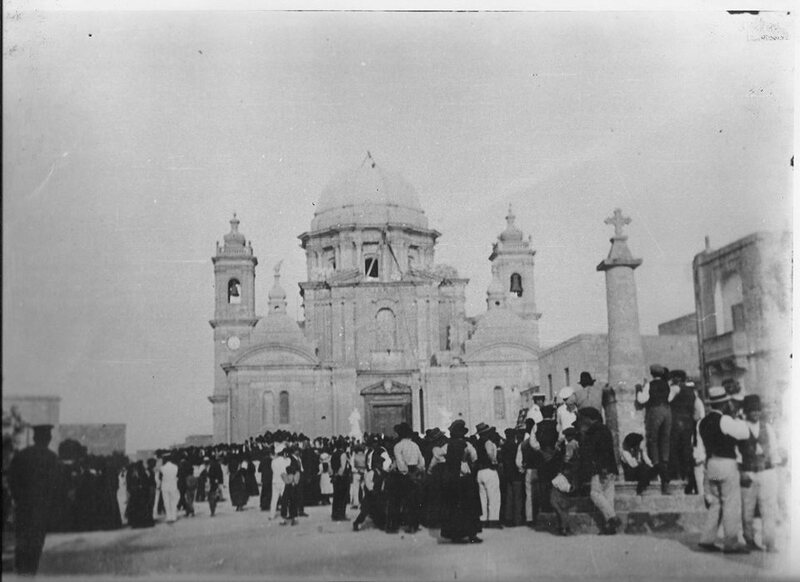 When bishop Palmieri elevated Ta' Nadur as a parish, the locals wanted the new church to be built in their own hamlet. 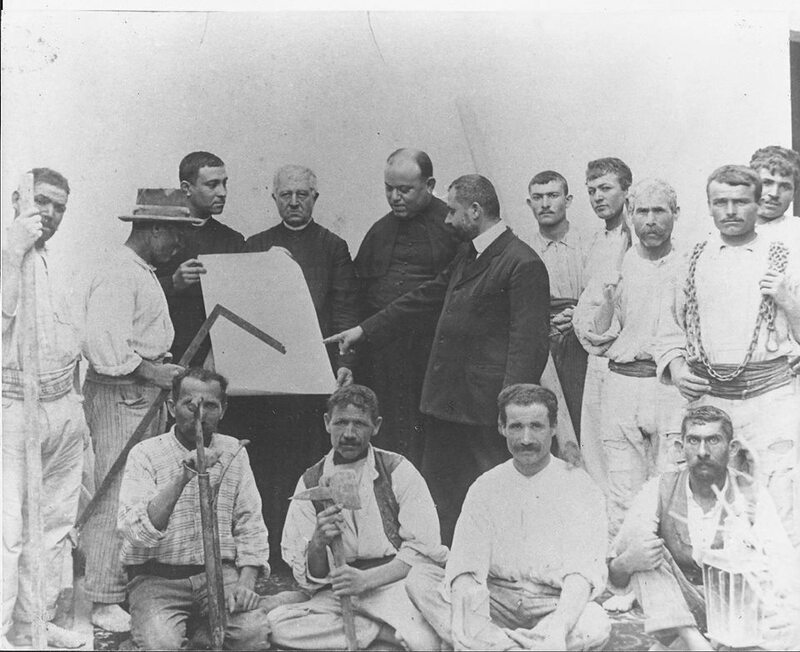 The first parish priest Don Bernard Haber asked a good person Gregory Buttigieg to help choosing the site for the new church. This man loaded his donkey with stones and let the donkey walk. Many people gathered to pray and where the donkey stops to rest, the place for the new church will be chosen. The donkey stopped on the summit, the highest point of Nadur. 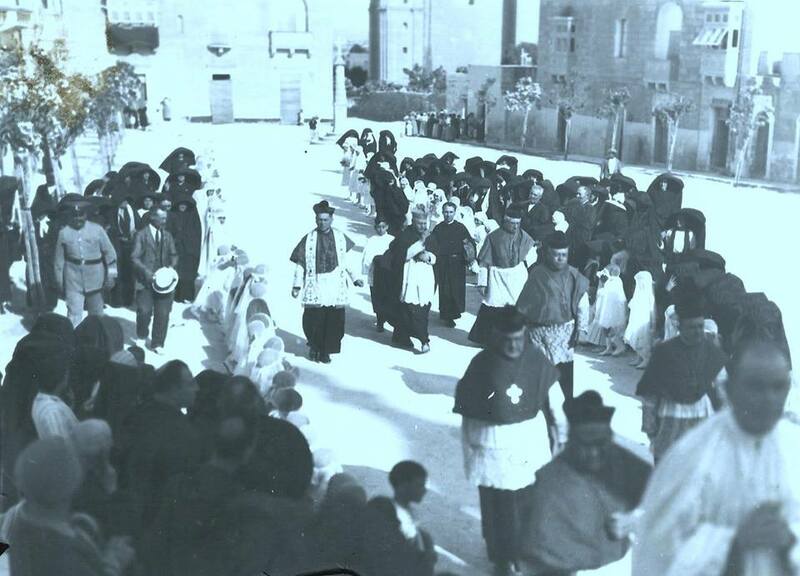 Ta' Hida was one of the places reserved by the Grand Master Wignacourt of the Sovereign Order of St. John of Jerusalem. No one was allowed to hunt with shot guns, trapping, dogs or ferrets. The penalty for anyone caught hunting would have been three years rowing on a war vessel. Grand Master De Vilhena introduced the tradition to send a falcon to the king of Portugal as a sign of friendship (Abela Ciantar; History of Malta of Debono. Can. Agius De Soldanis (vol 1. page 49 says the government had his own trappers and they caught up to fifty falcons in one year. They were then trained by the Grand Master's falconer and sent to the Vice King of Sicily. and other kings. The Maltese people who work at Orica Chemnet in Laverton, Melbourne are often known as the Maltese Falcons, a name attributed to them from the history linked to Ta' Hida. Can. Agius De Soldanis wrote that there was a court house at Ta' Hida. Small civil cases were heard there. Most of the time the magistrate was a respected person chosen by the people. In the guide to Gozo, appendix V111 we read Anastasi originated in Italy, came from Rhodes with the Knights Hospitalers and many of his members held high posts for two centuries. A judge of the name held his court at Nadur in a farmhouse, which exists to this day, and is one of the finest in the district. So judge Anastasi who came from a noble family had his court at Nadur. A noble family judge surely wasn't a magistrate for a small civil matter. In the Guide to Gozo the writer didn't say that the court house was at Ta' Hida. The house that was one of the finest and still exists today is the house of the Mayoress (Sindkuwa) in St. John Street. In the house there is a room that is called up till now the room of the prisoners. Some people says the court house at Ta' Hida was the one in ruins in Bin Gemma Valley road. From ta' Hida one can see the best panoramic views of the Maltese archipelago. The whole island of Gozo, Comino and as far as the eye can see of the sister island of Malta. 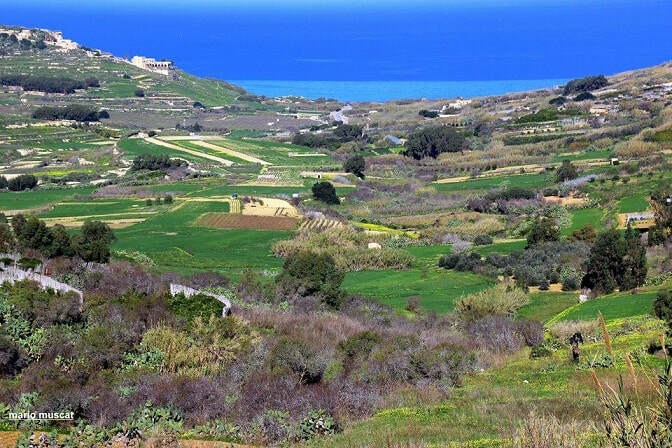 Ta' Hida can be reached from Rabat Road, the main route from the city of Gozo and most of the other villages. Church Street links Rabat Road to the town centre. From Ta' Kenuna Tower one can see the rest of the islands below and the best panoramic views of the islands. From Ta' Hida we continue our way further towards the sea. At the intersection of Hida Street, Hanaq Road, Bingemma Street and Ramla Road, one can enjoy the magnificent view of Ramla Bay Valley. The Valley is wide and beautiful. As we move further down the road we reach a relatively new village of Tal-Hali. This estate was established in the seventies. On your right. a road will take you to Ramla Upper, there is a small hamlet there with a few houses. Some of the most beautiful scenery can be seen from Ramla Upper. St. Blas Bay, Irdum iz-zghir and Ramla Bay. The wonders of Nadur can be enjoyed at Upper Ramla with its beautiful coast line, blue Mediterranean sea, the villages of Xaghra, Zebbug, Xewkija in the distance and the basilica church of Nadur with its town centre. The road on your left will take you down to Ramla Bay. The red sandy beach of Ramla is magic. once Peter Paul Portelli said that there is no place in the world like Ramla. Truly God blessed Nadur with such beautiful places. A statue of Our Lady stands tall on a large pedestal in the middle of the bay. Grand Master Manoel De Vilhena planted a lot of grape vines in the area. The red sandy soil is ideal for planting grape vines, oranges, lemon and many other kinds of fruit trees and vegetation. In 1743 an invention by Frank Marando was to dig a large hole in a big rock that can be filled with small rocks and gun powder that can be fired on the enemy ships. The rock is called the "Fagozz" and still exits today. Also a wall was built under the water, across the bay to make it difficult for enemy ships to land in the bay. As we go back up the hill to Ta' Hida, we turn left to Bingemma Road and enjoy a walk in the valley. As we start the walk, the place is called "Tax-Xemx" sunny side,. Further down we see a house in ruins, people says that it was the old court house of Ta' Hida. The house is near the Olive gardens which still exits today. On your right one can see the houses of "Wied ir-Rihan". As the road comes to an end, one can turn left and back to Ramla Road or walk a steep hill to the right and brings you to the hamlet of St. Blas. The hamlet of St. Blas carries the name after a chapel that once stood in the area. As we start our walk down to the bay one can enjoy the beautiful gardens of fruit trees of all sots, apples, oranges, lemons, pears, plums and vegetables. On the opposite side of the valley one can see Irdum iz-Zghir with its gardens green all year round. In the old times, much of the fruit and vegetables grown in St. Blas, was transported and sold in the Maltese markets. Today much of the vegetable crop planted in St. Blas are grown in glass houses.. On your right one can see the huge rocks that once fell from the high cliffs of Irdum il-Kbir. St. Blas is a lovely place to visit, the scenery are fantastic, the beautiful fruit and vegetable gardens and the red sandy beach makes it unique in the Maltese islands. St. Blas bay is blessed because it is very hard to reach it and it hinders the Maltese and other Gozitans to go there. The local people of St. Blas and some tourists normally visit this beach to enjoy the stillness and the beauty of this tiny bay. Dr. Joseph Bezzina refers to this bay as like some place on an exotic island in the pacific ocean. Migriet u oqsma, bahar, gonna w fjuri. As we huff and puff all the way up the steep hill, a short walk on the left will take us to the recently refurbished Ta' Sopu Tower. The tower was built in 1667 by the Universita of Gozo to keep a watch on the north shore of the island. This is how the motto of Nadur VIGILAT "On the Lookout" was created. Turning left down the valley of Dahlet Qorrot, one can enjoy a beautiful and breathtaking walk. The valley is always green with all sorts of vegetables. There is plenty of spring water to provide for the plants all year round. At the top end of the valley the Buskett Gardens use to attract many people at the feast of St. Peter and Paul to celebrate Mnarja. Folk singing was very popular in those days and newly weds use to go to this garden at Mnarja to celebrate their honeymoon. Before we reach the bay and start a steep walk down, on the left there use to be huge rocks built on top of each other. Historian Can. Agius De Soldanis says that this rocks can only be placed there by giants. The place is called Ta' l-Imsaqqfin. Dahlet Qorrot Bay is a lovely place, very romantic, its like living in a different world. The bay has a ramp for the boats of the local fishermen and garages dug in the cliff to store their boats. Today some of the garages are used as a shelter from the hot summer days. These dug outs keep very cool in summer and locals can enjoy their meals in a lovely atmosphere. Contrary to Ramla and St. Blas bays, here the sand is white. The boys try to show off especially when there is girls around, they jump from the rocks. This is a fantastic place for a BBQ, there is no need to say more, many Nadurin young and old gather in groups to enjoy an evening eating and drinking while the sun sets behind Ta' Sopu Tower. The stillness of the night, the BBQ and and the company of the group, eh its just beautiful. St. Philip Bay in the same area was a swimming place for women only, now a days women are much different and are not afraid to show as much as possible. Thanks to the Nadur City Council now there is public convenience in Dahlet Qorrot. As one return back to "Wied ir-Rihan" and start from the intersection of Racecourse Street, Qala Rd. and St. John Street, on your right there is a niche of Our Lady of Ta' Pinu and further up the road there is the historic place of the "Sindkuwa" the mayoress of Nadur in the old times, possibly the wife of the Mayor at that time. On your left at St. James Street, there is the famous bakery of "Tal-Maxokk". This bakery is widely known for its mouth watering pizza. The Maltese will smell it from Mgarr harbor, infact they probably order their pizza before they leave their home in Malta, yummmm smell terrific a bottle of red wine and beautiful view at Dahlet Qorrot oh and let the world goes round. Next up on your left is Grunju Street, at the corner of St. Andrew Street and Grunju St. use to be a wine bar 29th. June named after the feast day of the patron saints of Nadur. On your right there is the views of the Gozo channel with the island of Comino in the middle. On your left St. Andrew St. will take you down to St. James St. and Buskett Road. Named after the former garden "Buskett" small forest the garden was a haven for the Mnarja celebrations. Can. Gian Piet Agius De Soldanis says that in the year 1500 the Buskett gardens was the property of the noble family Navarra. Today there is a farm house on the property and a vegetable garden and some fruit trees. Not much is left from the original garden full of carob, olive, lemon and oranges. Buskett gardens use to attract many people from around the island for the celebrations of Mnarja till 1912 when the procession with the statue of St. Peter and Paul was still held in the morning. Can. Agius De Soldanis assures us that in 1720 the groom use to promise his future wife to take her to the picnic of Mnarja at the Buskett. The cooking of the rabbits, the wine, the folk music and singing ehhh. One could only imagine how nice it use to be. Dressed in what it is today the Maltese costume, fantastic. All of this came to an end as Roman Sultana from the village of Xaghra settled in Nadur and took hold of the Buskett gardens. He eventually stopped people from entering his property, cut down the trees and started growing vegetables. The land there has plenty of spring water coming from fountains that our forefathers dug in the limestone. Where were the greenies then? From Buskett gardens one can turn back to St. John Street, which takes you to the intersection of Mgarr Road and Xandriku Street. Exactly on that intersection lived Nadur's own historian Can. Dun Karm Caruana. Today thanks to all those involved a statue of Dun Karm is erected near the entrance to the Park land in Xandriku Street. Here we have the most exciting views of the island of Gozo. From here you see the small village of Mgarr with the church of St. Anthony of Padova below, the villages of Ghajnsielem, Qala, the island of Comino and as far as the eye can see from the sister island of Malta. Mary Mejlak summed it up in her poem. Int ghaggibtni u mohhi hadtli! X' hemm f'wicc Ghawdex minnek isbah? Xandriku Street will take you to the Town Centre and to Church St. back at Ta' Hida. Two large water tanks are situated in Xandriku Street to provide water to the town.